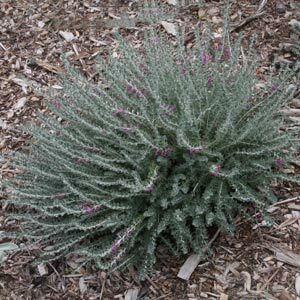 Also known as ‘Cat Thyme’, Tecurium marum is a drought tolerant small evergreen shrub from Spain. 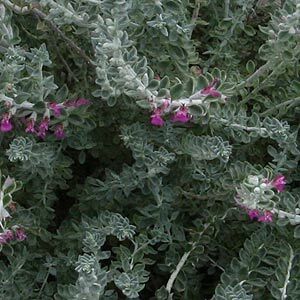 Also known as the Mediterranean Germander this is a plant that has been in cultivation for centuries. This is an excellent plant for the dry border, once established it requires minimal care and is drought tolerant. The plant does look a little like thyme, however it is not related. The common name ‘Cat Thyme’ comes from the way that cats seem to love it, sends cats into a bit of a frenzy, so plant away from your feline friends. Tecurium marum is also said to have homeopathic uses. The essential oils are extracted and used. Grown for the silvery grey green foliage and the flowers which are a welcome addition late in the season. Try planting Tecurium marum mixed in with native plants for a little variety. Grow it amongst Salvias, Agastache and Sedums. Also useful in the succulent garden to add some breaks in planting. This is a plant that is a worthy addition to the rock garden where its evergreen nature provides year round interest. Tecurium marum – Foliage and flowers. A little pruning after flowering is all that is really required. This helps maintain a more bushy compact habit. This is a self fertile plant and is pollinated by the activity of bees which it attracts to the garden. It is easier to propagate from softwood cuttings taken in spiring. Height – .8m Spread – 1m. Position – Full sun, not suited to shaded areas. Foliage – Gray green and fragrant when crushed. Lanceolate in shape with a slight indumentum beneath. Tecurium marum is available for sale online from the following nurseries.